Getting into ghost hunting can seem daunting. Everyone who is a ghost hunter already seems to know all about it and they throw around words like ‘trifield meter’ or ‘EVP’ or ‘full-spectrum camera’ that can be a little bit overwhelming. 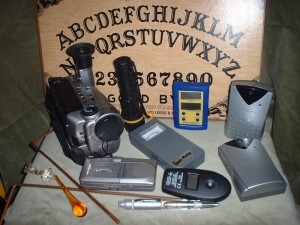 I decided to find out what a basic ghost hunter would put into a kit, what those things are and tell you about it. I then went a little deeper and found out about some of the really good stuff that the experienced paranormal investigators use. Please do bear in mind that different people will have different opinions about what is and isn’t necessary to bring. This is a compilation of opinions that I’ve found seem to be fairly consistent. Here is what I discovered might be considered a ‘basic’ ghost hunting kit. First and foremost is a digital voice recorder. This is good because you can record you and your teams observations without stopping to look down at a piece of paper or a laptop all the time. That is only a bonus reason to have a voice recorder with you, the most important reason is for the chance of capturing and an ‘electronic voice phenomena’ or EVP. That’s when the tape is played back and a voice or sounds are apparent on the tape that aren’t there when you listen to them with your physical ear. A Thermometer. It’s a basic enough item to have in your tool kit and even a cheap one will show you if the room really is getting colder or if you’ve just psyched yourself out. With a thermometer you can document how warm the room was and then how cold it is when you think you feel a cold spot. For best results don’t rely on a thermometer from the dollar store. Infrared probe thermometers aren’t very expensive but they can pinpoint where a cold spot in, how cold it is and how big even when you are on the far side of the room. You can use it to ‘sweep’ the room and get accurate results to find out what is going on temperature-wise without even standing up. A pencil, eraser and a pad of paper. You have your digital voice recorder but sometimes it’s a good idea to draw a diagram. That way you can draw where the cold spots and other phenomena may be located and give a better source for documentation. It is also good for quick little notes and anything else that you might think of that you don’t want to go through and listen to the tape again for in order to find. It’s a very cheap and handy addition to your kit. Finally we start to get into the fun and more professional sorts of toys that sound swish and are also extremely useful for documentation as well as discovery in an investigation. Thermal camera is a useful item for ghost hunting. It is used to show representations of cold and hot spots. It has been said to be able to record actual ‘people shaped’ cold or hot spots where there isn’t physically a soul to be seen. Less expensive ones can be purchased for a couple hundred of dollars but the more pricey ones can go into the thousands. Electronic Frequency Meters or ‘EMF’ meters are used to safely monitor electromagnetic frequencies in many fields. They are a cheap and important tool for ghost hunting. The cheaper ones can be as little as $25.00 and they even have an app for your smart phone that you can download (although I wouldn’t count on the app being as accurate as a physical EMF meter. Ghost hunters use them to detect frequencies of spirits believing that spirits give out and EMF different from the living. EMF meters can be a little overwhelming to someone looking at one for the first time. The different settings are just to scan through different types frequencies and make sure nothing is missed. It’s also called a trifield meter because it measures three different fields. Usually the first setting is just to make sure that the batteries are working and the needle will surge and then fall which means that it’s ready to go. If the needle doesn’t surge all the way and then fall it would be a good idea to check the batteries (you made sure to bring spare batteries…right?). Once you’ve seen that your batter are good you can set it to one of the settings and count on it to function according to specs. To become better versed in what these frequencies signify ask an experienced ghost hunter or stay tuned for more information here at the National Paranormal Society. give them a chance to know that they aren’t alone. so there is a much better chance of snapping an apparition. Other considerations for the you to thing about before your first investigation are important as well. It is essential that you are prepared when you go ghost hunting or searching for anything else paranormal that you follow the boyscout creed and always: Be Prepared. Are you prepared to spend the entire night in a haunted location? Have you dressed appropriately for the weather? Are you prepared for a sudden change in the weather? Wear comfortable clothing and footwear that will ensure that your feet our protected from debris and nails. Consider obtaining a two way radio so that if cellphones cease to function (a common complaint of ghost hunters) you have a backup plan to communicate. Be sure to stick to the basics of any hunting, camping or other exploration: make sure someone knows where you are going and when you plan to be back. Have an emergency plan for a meeting place in case someone gets lost. Most importantly, have fun!